A fairly obvious allegory to begin with, Solomon Kane suffers every time director Michael J. Bassett starts taking his film a bit too seriously and shoving its message down our throats, at one point going so far as to have Solomon (James Purefoy) nailed to a cross. 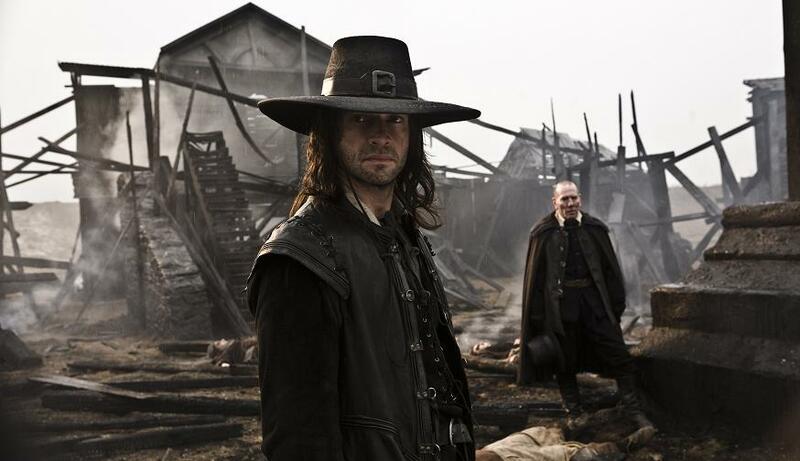 It's a shame that Bassett lets the religious paraphernalia encroach on what is otherwise a decent romp through medieval middle-England in the company of now-reformed soldier Kane, who can't kill another man on pain of being taken to hell by the devil's minions. Of course, in a film that promises as much bloodshed as this, it's not long before Solomon finds himself morally confused and needing to protect William Crowthorn (Pete Poselthwaite) and family from sorcerer Malachi (Jason Flemyng) and his mysterious masked outrider. It doesn't take a degree in medieval studies (or anything for that matter) to work out where the plot's going and the forty-minutes of very entertaining setup is rather let down by the oh-so predictable twenty-minute conclusion where a famous veteran actor is roped in to explain everything to those in the cheap seats. Like the allegorical elements, Bassett seems to let his overwrought explanations run away with the film and at numerous moments we wander off into heavy exposition territory. Rule out those moments though (not forgetting, of course, the allegorical ones) and Bassett's self-written script gives Purefoy enough material to show he could really be very good at this sort of thing. Kane is threatening and without humour but his moral code is well carried in Purefoy's sway and accented lilt whilst the comedy sidekick is well avoided and, indeed, parodied when Mackenzie Crook shows up further into the piece. There's also some stunning cinematography here and the occult tendencies of something like Constantine mix well with Peter Jackon's Middle Earth-alike browns and greens. In fact, one shot - of Kane alone in an Inn - seems to directly reference Jackson's work on The Lord Of The Rings trilogy and if that is what influenced Bassett visually then he could certainly do far worse. A visual treat and a generally fun action-romp, let down only by its serious, rather self-important, attitude. It could definitely have been better but I thought there were enough good moments to justify recommending it - fun but nothing revolutionary. I'll try and take a look at your review.